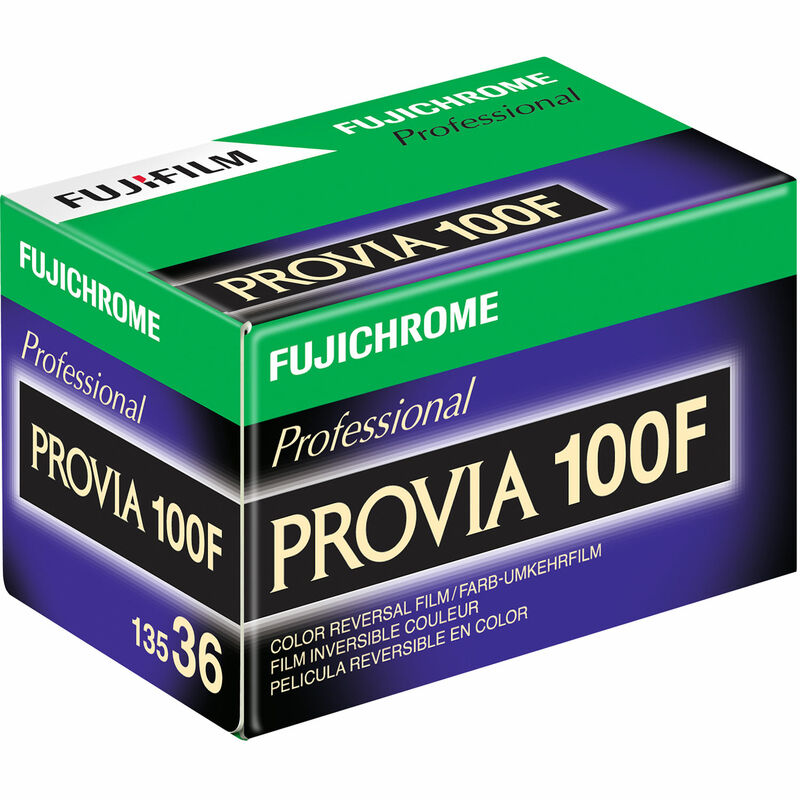 Fujichrome Provia 100F Professional RDP-III from Fujifilm is a daylight-balanced color transparency film that exhibits a super-fine grain structure with vivid and naturally appearing colors and rich tonal rendition. It has a medium-speed nominal sensitivity of ISO 100/21° when processed in E-6, CR-56, or C6R processes and can effectively be pulled one half stop or pushed two stops with minimal variations in color balance and gradation. Excellent reciprocity characteristics also make this film highly suitable for use during long exposures and ensures consistent film speeds and coloring across multiple and extended exposures. Medium overall contrast and saturation make this film ideal for use in a wide range of photographic applications and is especially well-suited for use in product, landscape, nature, portraiture, and fashion photography. Box Dimensions (LxWxH) 2.37 x 1.4 x 1.2"
Fujichrome Provia 100F Professional RDP-III Color Transparency Film (35mm Roll Film, 36 Exposures) is rated 4.9 out of 5 by 162. Rated 5 out of 5 by CNW8531 from Best Slide Film I feel this is the best slide film out there. The tonal range and colors are good and consistant roll after roll. I switched from Kodachrome 64 to Fuji back in 1994 and have never looked back. I've used various Fuji films as well such as Velvia, Astia and Sensia, but I still feel Provia is the best and most accurate time after time. I know some K64 users might be wondering now what to do next with Kodachrome being dropped. I strongly suggest running a roll or two of Provia through your camera and see for yourself how bold and accurate it really is. You can always go digital any time you wish and so can I. After all, there's a reason why I'm still shooting film and it isn't because I can't afford to go digital! Rated 5 out of 5 by The Man in Shadow from The best color reversal film out there. Next to the sadly deceased Kodachrome stock there is simply no better color reversal film. It's been my stand-by for years and it's never failed to deliver. The contrast and skin tones are amazing. I think the only medium out there that surpasses it skin-tone wise is Fuji's FP-100C instant film. It also produces some wonderful pastel-like colors when you cross-process it. I've got some amazing blue skies and fiery red sunsets with Provia run in C-41. If you are not familiar with it grab a few rolls and start experimenting. It's easily the most versatile film stock I've used over the years. Rated 5 out of 5 by Nicholas from Impressed! After trying Fuji Velvia, I've decided Provia has the same high quality results with just a difference in saturation.Provia offers natural colors to make scenes and objects look lifelike and real. Skin tones are impressively accurate. Grain is smooth and sharpness is wonderful without being too sharp.Film base isn't too thin, and it dries with little curl, allowing easy mounting in cardboard slides. Easy to process and forgiving with time/temp variations by a few degrees or parts of a minute.Scans on my Epson V600 flatbed turn out beautifully. Just be aware that automatic color correction tends to change tones and skin tones may not be as accurate once scanned as they are on the slide. Overall, great for beginners and professionals. Highly recommended film. Rated 5 out of 5 by Jim from KODA WHAT? Fuji Provia 100 F 35mm slide film has been in my camera bag since 1998. Previously, I was a loyal Kodachrome 25 and 64 user. Unreliable processing, lost film, and a lengthy list of horror stories from fellow railroad photographers convinced me to make a change. Velvia's blues seemed too extreme. If you like the Kodachrome look (now unavailable anyway), Provia 100F is it. While you are at it, pick up Fujichrome mailers. Ignore the expiration date as Fuji assures me their processing center, Dwayne's Photo of Parsons, Kansas, will honor them as long as they are given enough slide business to keep the chemicals flowing. So, give your digital camera a break, blow the dust off that forgotten but trusty old 35mm SLR, and relive those glory days of slide shooting with Provia 100F! BTW, my 11 year-old slides, kept in archival sleeves in a dark room, look just as good as the day they were made. Rated 5 out of 5 by Tom from Fine grain, wonderful saturation I started shooting slide film for family travel for nostalgic reasons. I keep coming back to it because the results are stunning when properly exposed. The saturation is incredible with blues and greens so rich you could eat them for dessert. I find that it warms skin tones in a way that adds life to the photo. I do seem to notice more vignetting that negative film when shot wide open on the same equipment (or maybe its my imagination), but for my purposes it usually enhances the result. Rated 5 out of 5 by Lars from Love this stuff but The recent price hike is terrible. Great film but it looks like Fuji wants to price this so high to stage it for discontinuation. Rated 5 out of 5 by William from One of the survivors I've been using Provia for years. From the film era to the mostly digital era for me. It has always delivered rich accurate colors and captured fine detail. The colors are a bit strong for portraits, but accurate. Fuji discontinued Astia long ago so this is a good substitute. With so many films getting the axe these days, there will be a few that survive for the few film enthusiasts out there. And I really think Provia 100 will be a survivor for long to come. Provia 400 got discontined a couple of years ago, but Provia 100 can be pushed a stop or 2 with good results. Long live Fuji E6 films-I don't think they'll totally get out of the slide film race like Kodak did. Shame on Kodak for that! I'm glad Fuji has allowed me to keep on using those wonderful old film cameras with E6 film. Rated 5 out of 5 by Kristallin from The Gold Standard of Chrome films... ... as far as I'm concerned, at least. True colors, great details, pushable (within limits), and never a dud roll in over 16 years. That says it all. Provia is probably as neutral as a chrome can get, so don't expect any fancy nuances, just true-to-nature reproduction of details and colors. If you like Velvia you may miss the supernatural color saturation, but all in all this is an amazing film that is versatile, and, most importantly, readily available. Love it, and even though I'm using the new Portras more and more, when I need to shoot chrome it's always Provia. Are the rolls stored in a refrigerator? Also, what is the expiration date on them?